Rob Martino offers some insights into his success with this unusual tuning, which combines the ergonomic benefits of "crossed" hands (or "open fingers") on bass 4ths that are reversed like the Classic Stick bass 5ths. This provides more compact scale positions and chord voicings as on bass guitar with its all 4ths tuning. Six strings in 4ths have an overall range of just over 4 octaves, compared to almost 5 octaves in 5ths (see 12-string Classic tuning). While mirrored 4ths gives up some of the Stick's huge bass range with those easy left hand open chords and two-handed bass lines, it opens up a different set of creative possibilities more like guitar and bass guitar. Rob's original composition, "One Cloud," illustrates his successful use of the Mirrored 4ths Grand Stick tuning. Since 2004, when I started focusing on The Stick as my primary instrument, I've used a mirrored 4ths tuning (having "flipped over" the bass 4ths after the first months of experimenting with parallel 4ths on both sides). Heavily inspired by the progressive and melodic sounds of bass players like Geddy Lee (Rush), Pete Trevawas (Marillion) and Chris Squire (Yes), as well as the intricate acoustic guitar playing of Ian Anderson (Jethro Tull), my goal was to arrive at a tuning which facilitated elements of these particular styles of playing. I also had an interest in adapting baroque keyboard music, in which both hands share similar roles — another advantage of the mirrored 4ths tuning. Around this time I also moved to Virginia, which allowed me to get some useful feedback from Greg Howard as I explored the possibilities of this tuning. Obviously, I'm not the first person to use a mirrored 4ths tuning, but there are certain elements of this tuning and the particular pitch ranges I've chosen that have allowed me to develop a useful left hand accompaniment style, and for me has made the Stick a very intuitive and satisfying tool for musical expression. One clear advantage of mirrored 4ths is the similarity of finger motion for baroque style counterpoint and inner moving parts as well as unison lines in each hand. The mirror image of the chord and scale shapes correspond to the mirrored hands themselves, each hand approaching the fretboard from opposite sides. The hands thus share the same ergonomic relationship to all the intervals, and except for the greater left hand stretch across the lower pitched, wider spaced frets, both hands share identical shapes and movements when playing a chord or a line in any register and transposing to any key. Also, by starting at the center of the strings on a lowest bass E and a lowest melody B a 5th higher, there is a nice relationship between string sets. With each hand separated one inlay apart (a 4th interval along the fretboard), all lettered notes match in octaves. I start on a low bass E, going in fourths up to F. I've found that this range provides sufficient low end (after all it's suited 4 string bass players for decades!) and high enough for clear sounding chords. With enough space between the root and remainder of the chord, some full rich sounds are possible, comparable to acoustic guitar voicings plus a bass range root note. The melody group of strings starts at a high C below the guitar's high E string, an extends down to the B below guitar low E.
A nice discovery of the E to F bass range and B to C melody is the "virtual low B" string. With the fifth interval between strings sets, very wide chord shapes based on 7 strings of bass in 4ths can be played using the lowest melody string in addition to any of the 6 bass strings (an octave higher than an actual low B of course). 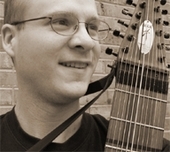 Inverted bass strings open up the hand while playing chordal accompaniment, enabling various ornamentation techniques that would be difficult in the "normal" direction of pitch of bass guitar (in which case the fingers, as with many guitar chords, are somewhat scrunched. Of course, this is not a problem on guitar where the right hand executes the note, but the reversed direction of pitch becomes an important factor on The Stick where the fingers must shape AND articulate). In some cases, thick five-note "super triads" are possible. The example below shows the more open fingerings resulting from inverting the bass 4ths. Having the entire scale lying under the hand in the 4ths tuning allows me to hold chord tones while playing scalar/pull-off ornamentation with other fingers. Ornamentation and fills can happen both in the bass line and lower guitar range. The Stick is an ideal width for crossed tunings, providing a great deal of leverage- the instrument is centered on the body and the arms, hands and fingers can really "lay into" the strings, allowing for a great degree of expression. In crossed tunings, all fingers also have access to all 12 strings- for example, I've been trying to incorporate the right hand thumb on the bass strings to a greater degree. This has been an exciting tuning for me personally, as it has allowed me to more closely speak the language of some of my more profound musical influences, and in turn helped me to develop a style unique to the Stick. Arrangements and composition ideas seem to flow from this quite naturally, and I'm eager to explore more possibilities.